This extensively updated second edition of LTE Signaling, Troubleshooting and Performance Measurement describes the LTE signaling protocols and procedures for the third generation of mobile communications and beyond. It is one of the few books available that explain the LTE signaling messages, procedures and measurements down to the bit & byte level, and all trace examples are taken for a real lab and field trial traces. This book covers the crucial key performance indicators (KPI) to be measured during field trials and deployment phase of new LTE networks. It describes how statistic values can be aggregated and evaluated, and how the network can be optimized during the first stages of deployment, using dedicated examples to enhance understanding. 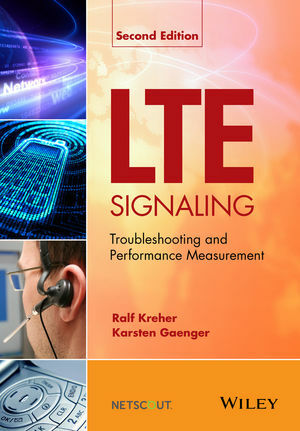 Written by experts in the field of mobile communications, this book systematically describes the most recent LTE signaling procedures, explaining how to identify and troubleshoot abnormal network behavior and common failure causes, as well as describing the normal signaling procedures. This is a unique feature of the book, allowing readers to understand the root cause analysis of problems related to signaling procedures. This book will be especially useful for network operators and equipment manufacturers; engineers; technicians; network planners; developers; researchers; designers; testing personnel and project managers; consulting and training companies; standardization bodies. Ralf Kreher works as Senior Software Architect for Tektronix Communications (Test and Optimization) business with focus on UMTS and LTE Performance Measurement and Key Performance Indicator (KPI) implementation. Before joining the engineering department he lead the Tektronix Mobile Protocol Test Customer Training Department for almost four years being responsible for a world-class seminar portfolio for mobile technologies and measurement products. Kreher holds a Communication Engineering Degree of the University of Applied Science, Deutsche Telekom Leipzig. He is internationally recognized author of the books UMTS Signaling and UMTS Performance Measurement. Karsten Gaenger received a Dipl.-Ing. degree in electrical engineering from the Berlin University of Technology. He was with the Fraunhofer HHI research institute from 2004 to 2006. During this time he published several IEEE papers on his development of a reliable real-time streaming system and protocol for Mobile Ad-Hoc networks. His research interests are mobile communications, IPTV, and robust real-time video streaming. Currently he is with Tektronix, Inc. and takes part in the mobile test and optimization division for 3G and LTE networks. He is a Solution Architect with RAN focus for testing and monitoring real-time multi-media streaming in next generation mobile networks. His current projects include the development of a passive LTE air interface probe.